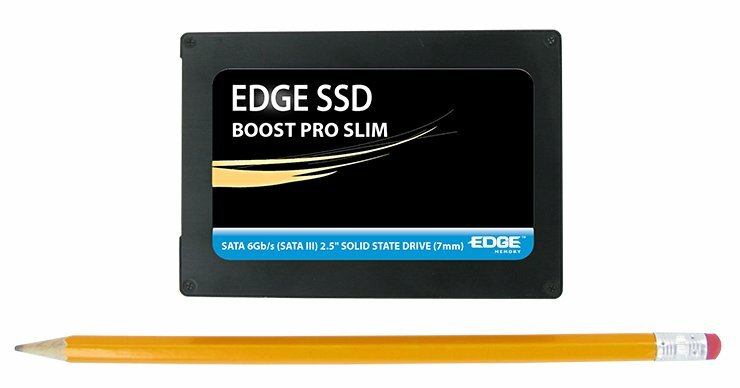 EDGE Boost Pro Slim SSDs are TAA compliant, built with premium SandForce controllers, and backed by a superior five-year warranty. EDGE™ Boost Pro Slim Solid State Drives (SSDs) are designed to be a direct replacement for traditional spinning disk hard drives. The result is a faster, lighter, more durable, and more reliable solution primed to replace outdated hard drives. 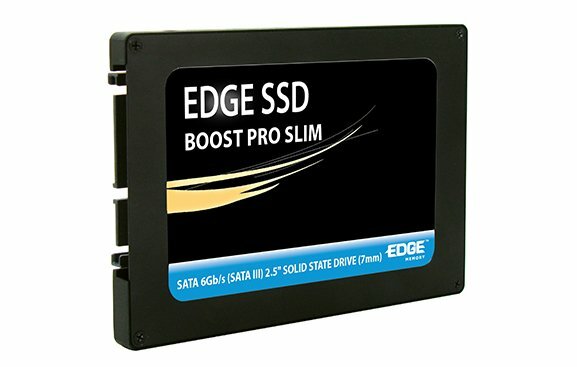 Boost Pro Slim SSDs are both PC and Mac compatible and will work in almost any computer or server with a SATA interface. The thin 7mm height is ideal for installation in Ultrabooks and small form factor notebooks. EDGE offers various notebook, desktop, and server upgrade kits designed to make the transition to SSDs a smooth and easy operation. 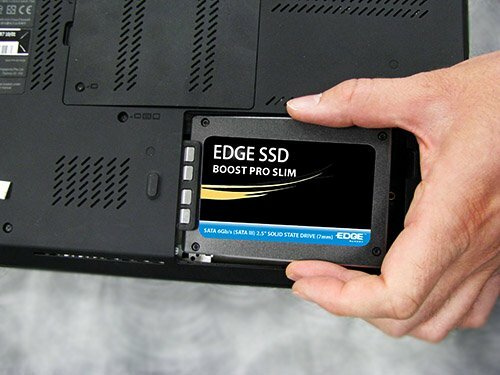 The Boost Pro Slim SSD achieves ultra fast read and write speeds. 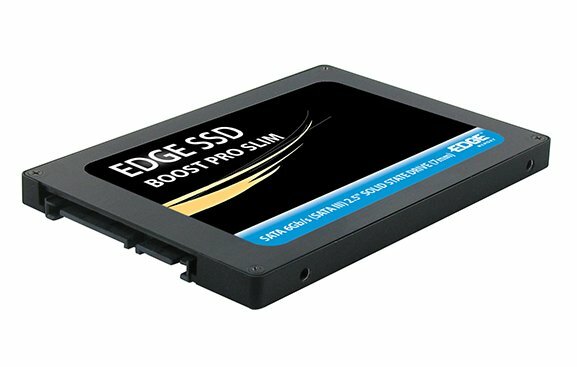 In comparison to hard drives, SSDs can decrease system boot times up to 5x. * Fast read/write speeds, coupled with a lofty max IOPS rating, provide fantastic performance gains in boot times, file access, and software application loading. A traditional hard drive can be compared to a car - with so many moving mechanical components constantly in use, parts inevitably wear out over time. With no moving parts inside, Boost SSDs are more reliable and less susceptible to mechanical failures than hard drives. This also results in longer notebook battery life, lower heat emission, and completely silent operation. Security is a critical feature of the Boost Pro Slim SSD, featuring AES hardware encryption that secures 100% of data when enabled. ** The feature-rich SandForce controller comes standard with robust tools such as S.M.A.R.T., Garbage Collection, wear leveling, and ECC to promote stability and reliability. SandForce -exclusive functions - Durawrite and RAISE - further enhance data efficiency and increase the lifespan of the SSD. *Based on EDGE testing results. Performance may vary depending on OS, configuration, etc. **Consult your computer's manual to ensure drive encryption is a supported function of the BIOS. Exceptional Performance - Ultra fast read and write speeds – substantial performance gains in file access, application loading, and more. Typically up to 5x faster boot times compared to hard drives. Extreme Durability - No moving parts - more durable and reliable than traditional hard drives that use a spinning disk. Low Power Consumption -Longer notebook battery life, more energy efficient, and runs cooler than hard drives. Feature-Rich - SandForce Driven – Includes a full complement of performance and stability enhancing features: TRIM, ECC, Garbage Collection, S.M.A.R.T., Durawrite, RAISE, and more. Compatible with Windows, Linux, and Mac OS X environments.